After having numerous miscarriages and then not being able to conceive for a few years, my husband and I decided to try fertility treatments. We had five cycles of artificial insemination, one resulting in a miscarriage and then three cycles of IVF which were all unsuccessful. Just before starting our final cycle of IVF I contacted April for a consultation as I had been advised to try acupuncture. April was very professional and approachable and showed a genuine interest in what I was feeling and going through. To our amazement we discovered I was pregnant but I still had to be careful given my history of miscarrying. I had acupuncture twice a week in order to hold the pregnancy and April became a real friend during this very tiring time, often giving me a longer treatment. I looked forward to the sessions and found them to be extremely relaxing and uplifting. April is very focussed which definitely rubbed off on me, I was able to follow a healthy diet and even cut out coffee. I am sure that acupuncture had a profound effect on my pregnancy as I felt on top of the world, had no aches and pains, slept very well and didn't put on too much weight which I lost within two weeks of giving birth. I highly recommend April and would definitely like to have acupuncture with her again for our next pregnancy. After a lifetime of painful periods I was finally diagnosed with endometriosis. After undergoing a laparoscopy, I researched what other options I had to keep it under control as I was told that there was every chance that it may return. After a conversation with April on the phone, she put me at ease. I continued seeing April for 4/5 months for acupuncture and chinese medicine treatment. During my treatment of the endo she also treated me for fertility as I was having problems conceiving. To my surprise I found that I was pregnant, my partner and I were delighted!! In terms of the endo, every month got better and better, with minimal pain, periods being less heavy with no clotting and bloating. Thank you so much April, you have literally changed my life!!. I would recommend April to anyone women that is experiencing painful periods/endometriosis, and/or fertility problems. She is truly an amazing lady. I would not know where to start when singing April's praises. I look forward to my session with her as I know that I will relax almost as soon as it starts. The advice she has given me is invaluable and my physical and mental well being have improved, thanks to her techniques, the tools she has given me to use independently and her serenity. April seems wise beyond her years and has got me through times of stress and acute sadness. I have happily recommended her to friends and my husband and daughter have both been treated by her. My daughter, then age 3, had been prescribed laxatives for prolonged bouts of constipation by my GP and after having taken them for a year, was told by the latter to stop, with no guidance as to how to do so or as to how we should prevent the constipation from returning. Thanks to April, my daughter was able to come off the laxative immediately; we have continued to follow April's advice and only wish that we had taken her to April in the first place. I cannot recommend her enough for all the help and wisdom and kindness she has given to us. After trying unsuccessfully to conceive for a number of years, my husband and I were advised that we should try IVF. Despite numerous diagnostic tests, doctors were unable to find any cause for our infertility other than mild endometriosis, which was surgically removed. Having read widely on the subject, I decided that I would have a better chance of success if I combined my IVF treatment with acupuncture and therefore contacted April shortly before my first cycle of IVF to see if she would be able to help. Although initially apprehensive about having needles stuck in me (having had a previously painful treatment some years ago), April immediately set me at my ease. From the beginning, I found April really approachable, warm and supportive. She impressed me with her professionalism, high standards of hygiene, holistic approach to my treatment and genuine interest in my difficulties. An unanticipated consequence of April's acupuncture treatment was that it also desensitised me to needles to the extent that I was able to inject myself for part of the IVF cycle, something that I had been really anxious about being able to do. Unfortunately, as is often the case, the first cycle of IVF was unsuccessful, but with adherence to April's dietary and lifestyle advice, regular sessions with her for acupuncture and a short course of Chinese medicine, I was thrilled to discover that I was pregnant from the second cycle. I have now passed my first trimester and continue to benefit from April's holistic approach to supporting me through my pregnancy. I can honestly say that I really look forward to my sessions with April, and always come away feeling very relaxed and positive, a combination, no doubt, of April's skill with the needles and gentle calm manner. I booked in for acupuncture sessions with April after suffering for roughly 2 years with fertility problems. Around 4/5 months later, I was pregnant! April is an amazingly kind and patient lady, who put me at ease from my very first appointment. Her acupuncture treatment combined with the nutritional advice she gave helped me to understand my body so much better, and I am very glad I chose to see her. The treatments were so relaxing and I really looked forward to each one! I would thoroughly recommend seeing April to any woman with fertility issues, it worked for me! Thank you April! 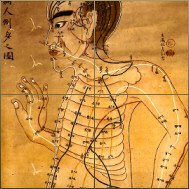 I have been benefiting from acupuncture with April for a couple of years now. She is very professional and takes a holistic approach to identifying the state of my mind and body before treating me. After each session my mind and body feel balanced, relaxed and stronger to deal with the stresses and strains of every day life. My husband sustained a severe anoxic brain injury following complications after heart surgery in April 2008. There is little or no treatment for this on the NHS, however one of the doctors at the hospital recommended acupuncture. April has been treating my husband for 10 months and he has improved over this time. April has remarkable insight into his condition and I believe has been instrumental in him being well and free from any debilitating ailments that are extremely common in people with his problems. April has a calm, gentle approach when working and is very thorough in her diagnosis. I intend to continue with April's treatment for as long as possible! I have been seeing April regularly for over a year now, mainly for treatment to alleviate the side effects of chemotherapy. The treatment has been very beneficial, for example in alleviating nausea and fatigue amongst other things. I have found April very knowledgeable, experienced and professional at all times. In addition she has provided me with an oasis of calm and support along with advice on diet, life style and relaxation techniques. I can't recommend her highly enough. After trying conventional medicines for many years I felt I needed something more to treat my ongoing asthma. I consulted April and over the past year she has not only helped me regulate my condition but has also treated a number of other related and unrelated issues that I had hitherto endured. April is incredibly intuitive, supportive and professional. Her results speak for themselves and I wouldn't hesitate to recommend her. April has helped me manage my symptoms a lot better, I have more energy, fewer headaches, fewer mood swings and a better understanding of the importance of diet and exercise. She has a wonderful mixture of professionalism and caring, which instills confidence in this ancient therapy. I had been suffering with insomnia for a period of 3 months. Having tried hypnotherapy and various medications, without success, I decided to try acupunture and chose April for this treatment. Thankfully after several visits I found that I was beginning to feel a lot better and I am now back to having normal sleep. I would highly recommend April to anyone as she is very experienced and thorough and carries out her work professionally with utmost due diligence. I feel that April has been very instrumental in helping me back to normality. I've suffered from constant indigestion and stomach bloating which just made everyday life very difficult and stressful. The common indigestion tablets available in pharmacies failed to do the trick. The treatment from April put an end to this because she managed to correctly identify the specific source of my problems. She gave me a very thorough and practical set of instructions on the kind of lifestyle I should be leading and provided me with some herbal indigestion medicines which have been extremely effective. I've always been a bit intimidated by doctors in general but her friendly persona has always made me feel comfortable and over the years we've built up an extremely nice rapport. April was initially recommended by a friend to help me through my first round of IVF and I have been fortunate enough to be under her guidance for over 6 months now. The support, advice and treatment I have been receiving has been invaluable. Not only have I have success with my first round of IVF and enjoyed a healthy pregnancy but my general well-being and approach to matters that would have previously caused me a degree of stress has greatly improved. This has not only been noted by me but also friends and family and therefore I am keen to continue my acupuncture sessions and remain open minded to all the advice April gives me. I am very grateful to April and feel fortunate to have such an experienced and approachable qualified person supporting me. I am impressed with her acupuncture techniques which I found more beneficial than other treatments I tried, including medicated treatments along with reflexology and food allergy tests. For me the time and money commitment is well worth it and even better than any spa treatments I've had! After tying to conceive naturally for a number of years, we realised that we need to go down the Assisted Reproduction route. We were classified as having 'unexplained infertility'. After 3 attempts at IUI and 1 IVF cycle, I decided to supplement my next IVF cycle with Acupuncture sessions. It was by chance that I came across April and I am so glad that I did! I went on to have 2 further IVF cycles which were unsuccessful and then finally decided that it was time to try Donor Eggs, if we wanted to have our dream. I am now pregnant on my second DE cycle at my age of 45. Through all this, April has been absolutely brilliant. She is so knowledgeable, professional, calm and kind. Her sessions are relaxing and make me feel so much more energized when I leave. She has advised me on my diet, relaxing techniques and I will always be glad that she got me into exercising, which I am sure has contributed to getting me where I am today. When I am anxious she is able to calm me with her acupuncture treatment and positive words. I am grateful to April for getting me this far and will continue to see her all through my pregnancy. I have no hesitation in recommending April if you are undergoing any Fertility Treatment.